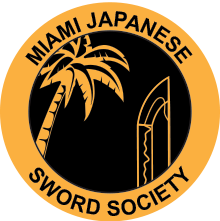 I am very happy to announce the grand opening of the Miami Japanese Sword Society (MiamiJSS). I have established this umbrella organization to promote and educate many people from all walks of society about the Japanese sword world. Personally the study of the Japanese sword and swordsmanship/kendo go hand in hand. My thirty plus years of professionally polishing antique Japanese swords and also training in Kendo, Iaido and Kenjutsu have shown me that the two arts are inseparable. The Miami Japanese Sword Society will sponsor and encourage people to not only train in Kendo, Iaido and Kenjitsu but we are also excited to now offer monthly meetings regarding the study of antique Japanese Swords. I have been urged by many students and clients to create and supervise a study group to learn about Nihonto or Japanese Swords. My background as a professional sword polisher puts me in a unique position to start a study group for those who are interested in learning about Nihonto. In the past I was fortunate enough to serve as Vice President of the New York Japanese Sword Society which provided me with a unique perspective on organizing and maintaining a Japanese sword inspired club. I found it very rewarding to guide students that truly have an interest in this field. At MiamiJSS we will explore the understanding of how swords are made, the different types of swords, schools of sword production and the smiths that were integral to that particular school. You will discover that the Japanese Sword was and is a spiritual creation that has inspired many people for centuries.